A One Hundred Dollar Confederate States of America banknote dated December 22, 1862. Issued during the American Civil War (1861–1865). English : A One Hundred Dollar Confederate States of America banknote dated December 22, 1862. Issued during the American Civil War (1861–1865). Coffin in a brick-lined crypt under the church in Wola Gułowska, Lublin Voivodeship, Poland. English : Coffin in a brick-lined crypt under the church in Wola Gułowska, Lublin Voivodeship, Poland. Old World Swallowtail on Buddleja davidii flowers. English : Old World Swallowtail on Buddleja davidii flowers. Honeybee (Apis mellifera) landing on a milk thistle flower (Silybum marianum). English : Honeybee (Apis mellifera) landing on a milk thistle flower (Silybum marianum). Jupiter as seen by the space probe "Cassini". This is the most detailed global color portrait of Jupiter ever assembled. It is produced from several high resolution images taken a little more than a day before Cassini's closest approach to Jupiter. English : Jupiter as seen by the space probe "Cassini". This is the most detailed global color portrait of Jupiter ever assembled. It is produced from several high resolution images taken a little more than a day before Cassini's closest approach to Jupiter. English : Apollo 15 Lunar Module Pilot James Irwin salutes the U.S. flag. Astronaut James B. Irwin, lunar module pilot, gives a military salute while standing beside the deployed U.S. flag during the Apollo 15 lunar surface extravehicular activity (EVA) at the Hadley-Apennine landing site. The flag was deployed toward the end of EVA-2. The Lunar Module "Falcon" is partially visible on the right. Hadley Delta in the background rises approximately 4,000 meters (about 13,124 feet) above the plain. The base of the mountain is approximately 5 kilometers (about 3 statute miles) away. This photograph was taken by Astronaut David R. Scott, Apollo 15 commander. Conversion of a DICOM-format X-ray from a ten year old male showing polydactyly. This is the patient's left hand, posterior-anterior projection. Identifying tags and such have been stripped. 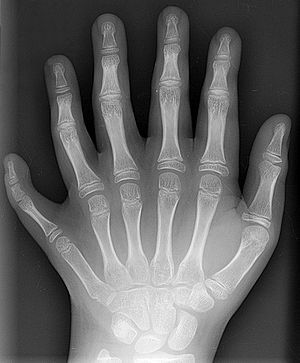 English : Conversion of a DICOM-format X-ray from a ten year old male showing polydactyly. This is the patient's left hand, posterior-anterior projection. Identifying tags and such have been stripped. Individual tomb on the Ruhestätte of the Saadi dynasty (1549-1664) in the city of Marrakech, Morocco. English : Individual tomb on the Ruhestätte of the Saadi dynasty (1549-1664) in the city of Marrakech, Morocco. Dreaming of the Tiger Spring in Hangzhou. 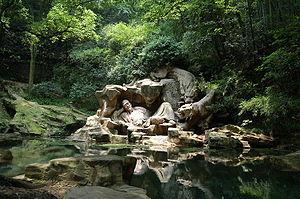 English : Dreaming of the Tiger Spring in Hangzhou. A young grasshopper (approx 17mm) on a grass stalk. Taken in Swifts Creek, Victoria, Australia. English : A young grasshopper (approx 17mm) on a grass stalk. Taken in Swifts Creek, Victoria, Australia. Antelope Canyon, Arizona, USA, Summer 2005. English : Antelope Canyon, Arizona, USA, Summer 2005. The Falkland Islands are an archipelago in the South Atlantic Ocean, located 300 miles off the coast of Argentina. They consist of two main islands, East Falkland and West Falkland, together with about 700 smaller islands. Stanley, on East Falkland, is the capital and largest city. The islands are a self-governing Overseas Territory of the United Kingdom. English : The Falkland Islands are an archipelago in the South Atlantic Ocean, located 300 miles off the coast of Argentina. They consist of two main islands, East Falkland and West Falkland, together with about 700 smaller islands. Stanley, on East Falkland, is the capital and largest city. The islands are a self-governing Overseas Territory of the United Kingdom. Western Gull (Larus occidentalis). Image taken in Monterey, California. English : Western Gull (Larus occidentalis). Image taken in Monterey, California. Taken by Apollo 8 crewmember Bill Anders on December 24, 1968, showing the Earth seemingly rising above the lunar surface. Note that this phenomenon is only visible from someone in orbit around the Moon. 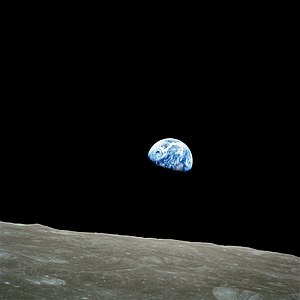 Because of the Moon's synchronous rotation about the Earth (i.e., the same side of the Moon is always facing the Earth), no Earthrise can be observed by a stationary observer on the surface of the Moon. English : Taken by Apollo 8 crewmember Bill Anders on December 24, 1968, showing the Earth seemingly rising above the lunar surface. Note that this phenomenon is only visible from someone in orbit around the Moon. Because of the Moon's synchronous rotation about the Earth (i.e., the same side of the Moon is always facing the Earth), no Earthrise can be observed by a stationary observer on the surface of the Moon. Panorama between Sax and Frümsen in the municipality of Sennwald in the Rhine Valley, looking from Kreuzberg (on the left), to the Appenzell Alps, Saxer Gap, the Stauberen, and Hoher Kasten on the right. English : Panorama between Sax and Frümsen in the municipality of Sennwald in the Rhine Valley, looking from Kreuzberg (on the left), to the Appenzell Alps, Saxer Gap, the Stauberen, and Hoher Kasten on the right. The 26m Radio Telescope at Mount Pleasant Radio Observatory, Tasmania, Australia. English : The 26m Radio Telescope at Mount Pleasant Radio Observatory, Tasmania, Australia.